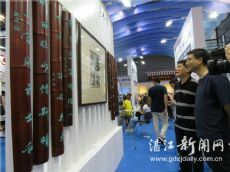 The five-day 13th China (Shenzhen) International Cultural Industries Fair (ICIF) closed on May 15 with Zhanjiang's exhibition clinching five project agreements and 12 weighty industry awards. The coastal city of Zhanjiang, Guangdong province, is steeped in rich cultural heritage and history throughout its lanes and alleys. Zhanjiang Yise Cultural Creative Park and Zhanjiang Museum took part in the event for the first time this year hoping to showcase integrated developments in culture, technology, finance, tourism and business. Also debuting at the fair was Zhanjiang No 45 Art Museum, with its exhibit dedicated to high-end culture and art. Bamboo carvings displayed by the museum attracted much attention for their sophisticated craftsmanship and profound conception. They were made by Wu Xiaoyi, a famous Zhanjiang calligrapher. Unlike similar artworks, these are elegant products for decoration which are expecting a wider market. Tobacco pipes manufactured in Leizhou obtained a gold medal at the China Arts and Crafts Cultural Creative Awards last year for their fresh design. The product, made of polished briar, attracted a purchase deal worth two million yuan ($290,275). Other awarded exhibitions included root carvings, drawings and handmade straw bags.